While I'm a girl who absolutely loves fashion, I also like being lazy. When it comes to my job, I can have the best of both worlds. I work from home and, typically, don't have to leave my house. I'll sit in front of a desk and write, promote, or any other little task that needs to be completed. This means that I don't have to leave my house throughout the week. When I first started my blogging journey I tried to listen to all the articles on the internet. You know the ones! Those posts that tell you to separate your workspace from your home environment. Alternatively, the ones that say you should dress like you are going to a typical 9 to 5 desk job. While I agree with all of these articles, I also know that we all have our personal ways to stay motivated and productive throughout the day. After a few months of dressing up each morning, I decided that it was silly and not necessary for me. While I wanted to change out of my pajamas to remind my mind that I was doing something, I didn't want to have to spend an hour getting ready just to sit at my computer in my house. Therefore, I came up with a comfortable at home wardrobe that can still be cute without making you feel like you have to be careful of spilling your mug of coffee all over yourself. If you work from home, these pieces might be for you. However, I do know some people do need to leave the house or do well when they spend time each morning getting ready. That is perfectly fine! This wardrobe might not be for everyone. Personally, I love these pieces because they get me out of my pajamas, are easy to change out of (when I do leave the house), and keep me comfortable throughout the day. When it comes to pants, I stick to comfortable sweats or loose shorts. I make sure to keep these separate from my loungewear so that they still have that mental feeling of work clothes. I also love these pieces because they are easy to take off and switch to a cute pair of pants if I do end up needing to leave the house. Are you just wanting to head for a coffee on your lunch break? You can comfortably wear these sweats and head over without judgment. Again, I pick sweats and shorts for the comfortability. When I'm sitting for hours on end at a desk, I want to be as comfy as possible. I don't care for jeans digging into my stomach, and I prefer to wear things that let me move around quickly (because sometimes I choose an exercise ball as my form of a chair). Honestly, the shirt is a simple piece that could be used for a typical desk job as well. You can quickly tuck a t-shirt into a cute pair of pants and throw on a blazer to make these go from lazy to professional. For the most part, I stick with t-shirts during my work days. I might wear a long sleeve during the colder months, but I usually go with lightweight materials if I do. I like breathable materials when writing. It might sound silly, but I can go from hot to cold fast when I'm not moving around that much. I want a shirt that can keep me cool, but it is still easy to add a jacket to for extra warmth. I'll also choose colors that are darker because, well, I'm a major klutz (I do actually spill coffee on myself almost every day). These are the items that you can have even outside of your home. In fact, I did have these pieces when I was working a 9 to 5 desk job that required me to leave my house and talk to people face to face. The jackets and ponchos, for example, are always a necessity when sitting. Again, your body can go from hot to cold fast when you are not moving around often. I like to keep something near me that is easy to throw on for added warmth. I also make sure to have house slippers, blue light filter glasses, and scrunchies next to me at all times. The house slippers are for the extra warmth (and they are just adorable). While I technically don't use these glasses (I have actual prescription glasses), these blue light filters are fantastic for anyone spending an extended amount of time in front of a computer screen. The scrunchies are for those girls who love the warmth from their hair until they can't stand it around their face. I'm always putting my hair up when I'm in the middle of a challenging project. Try to get a soft scrunchie so that you don't get those nasty indentions that other hair ties can leave. Even though you might look like a lazy girl with this wardrobe, you will feel so much more comfortable. I would rather worry about getting my article written than fixing my bra every two seconds when working from home. However, I could be alone in this feeling. 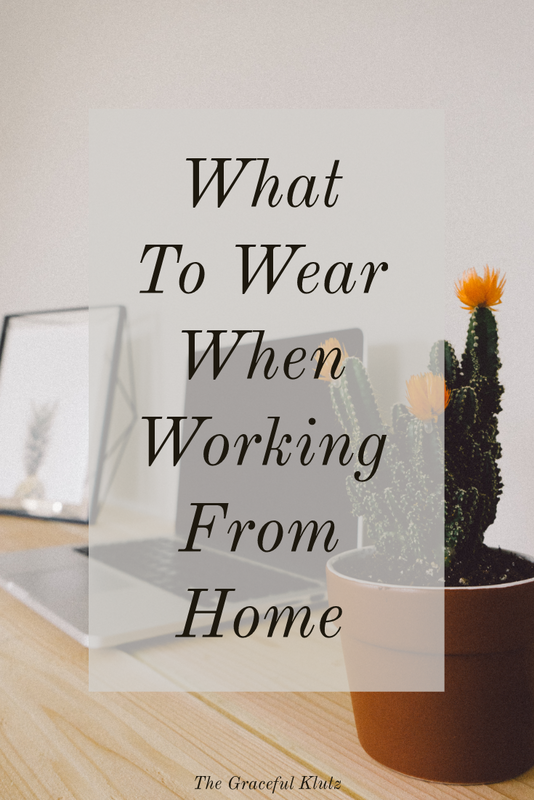 What do you wear when working from home? 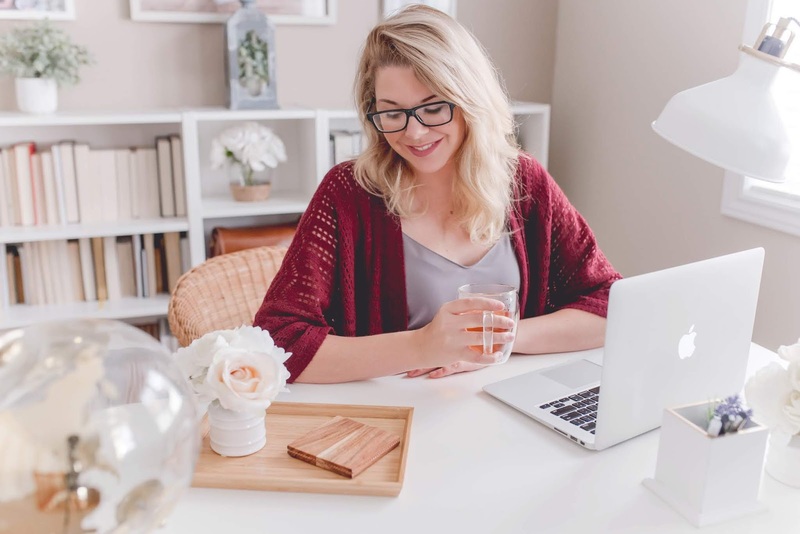 Are you more productive when you dress up or prefer to go the cozier route? Let me know in the comments below!